Members of the opposition mocked the decision. A Service Canada location in Toronto. 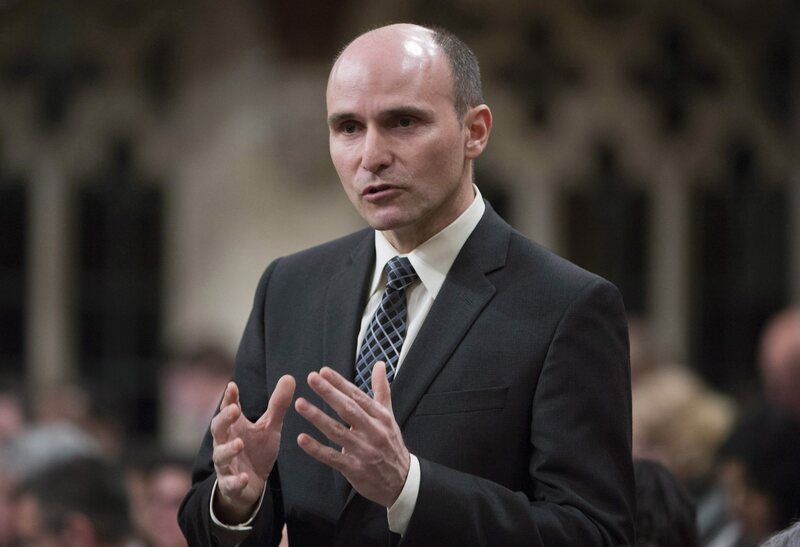 Families Minister Jean-Yves Duclos is defending a directive from the government department to ask its employees to use gender-neutral language when interacting with Canadians. MONTREAL — Families Minister Jean-Yves Duclos defended Service Canada's decision to ask its employees to adopt gender-neutral language when interacting with the public, as members of the opposition mocked the policy mercilessly. Workers are instructed to use a client's full name or ask how they would prefer to be addressed instead of using honorifics such as Mr., Mrs. or Ms., which "can be seen as gender specific by a client,'' reads the memo, which was first obtained by Radio-Canada. Families, Children and Social Development Minister Jean-Yves Duclos rises in the House of Commons in Ottawa on Friday, May 6, 2016. He had defended Service Canada's decision to ask its employees to adopt gender-neutral language when interacting with the public, as members of the opposition mocked the policy mercilessly. "I almost want to say I'm glad they don't have any bigger problems than that at Service Canada,'' he joked. But Duclos told reporters Wednesday that Service Canada's policies are a matter of respect. "Let us be clear, @ServiceCanada_E will continue to use Mr/Ms when interacting with Canadians,'' he wrote on social media. We are proud that @ServiceCanada_E reflects the diversity of Canada's population and is working to adapt to the reality of 21st century families. Duclos' press secretary, Emilie Gauduchon-Campbell, said the directive was issued in response to requests from members of the public who criticized Service Canada for a lack of inclusivity. Helen Kennedy, executive director of national LGBTQ human rights organization Egale Canada, praised Ottawa's directive as "a good first step,'' but said it needs to be accompanied with more awareness training and education around non-binary and gender-neutral language. "Some people may be very well-intentioned but they may not have the understanding or knowledge that they need in order to ask the right question in a manner that's not going to be offensive,'' she said in a phone interview. "Issues around gender-neutral language are extremely important, and they may not be important to the opposition but, I can tell you, they're very important to members of our community,'' Kennedy said.